I am a person that does my homework when, or I should say, before, I buy any new species or breed of animals that I have not owned before. 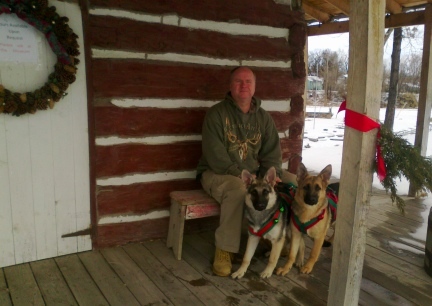 I have owned working dogs all my life. I have trained dogs for over 40 years. In 1987 I was deciding what large breed of dog I would like to own to be, an early morning, while still dark, walking partner with me. 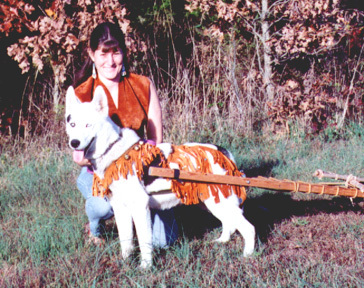 I had brought my research down to two breeds, German Shepherd Dog (GSD or GSDs) or Siberian Husky (Sibe). 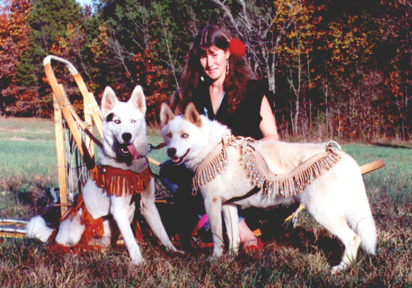 It was the Siberian Husky books that headed me toward training and Racing Sled Dogs in Harness, and later designing and handcrafting as well as selling Sled Dog Harnesses for our own and other people's Sled Dogs. 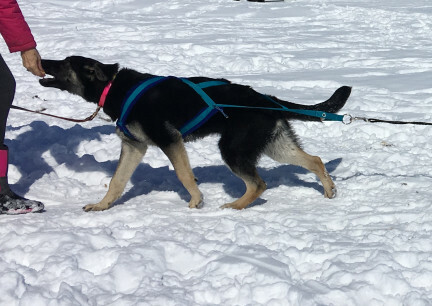 It was also one of the Siberian Husky books that helped me decide to go with the German Shepherd Dog Breed, the book said that GSDs make wonderful Sled Dogs. 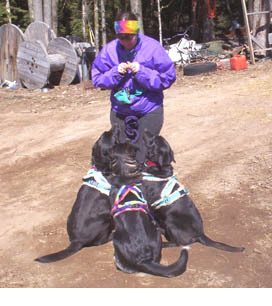 My next daydream was owing a three dog GSD Sled Dog Team. 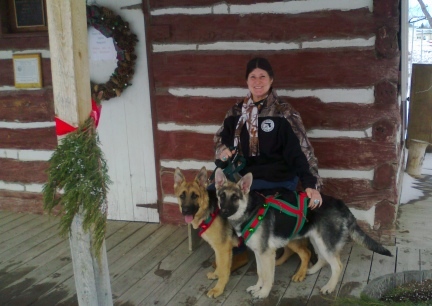 I did own three GSDs trained to pull, but that Three GSD Sled Dog Team has not happened yet....I am working toward that goal for 2016....in the mean time, I will be training my new young GSD puppies. 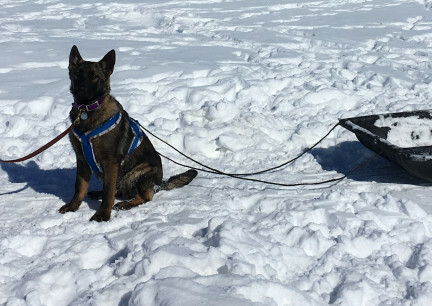 I have owned and trained several breeds of dogs to pull sleds, wagons, scooters, skaters, carts, travios...... one of those breeds, GSD. 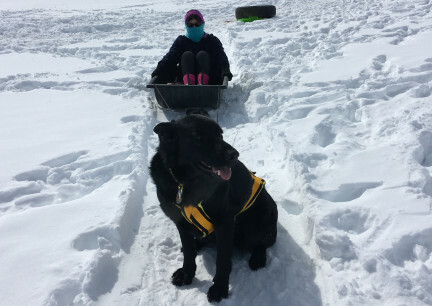 It is a TON OF FUN to have a well trained dog pull you down the trail, or just to have your dog pull your child's sleigh back up the hill while out sledding. Just make sure your dogs are healthy, and you have the right equipment. 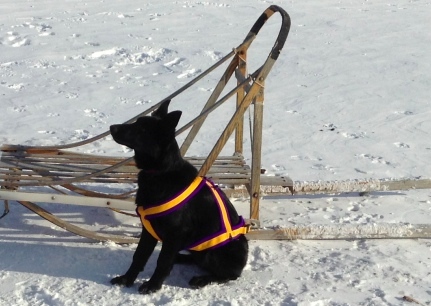 NEVER EVER HAVE A DOG PULL YOU BY THE COLLAR, or even pull an empty sled. I have set up a Journal, or Diary, if you will, below, of how I train my own sled dogs. You can scroll down and take a peak. I hope to have many photos there too. First let me say that I am not a professional dog trainer/instructor. 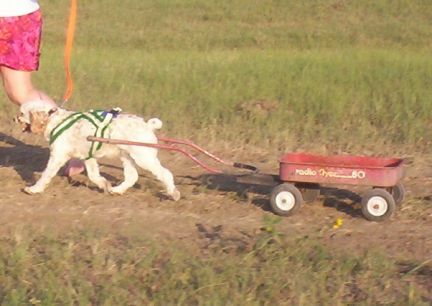 I have taught many dogs to pull for their first time and what I am writing has what worked for me. I do not know you, your dog or the type of trainer that you are. I am therefore not responsible for any accidents or injuries that may occur with your dog training. Always start any dog training with the proper equipment. 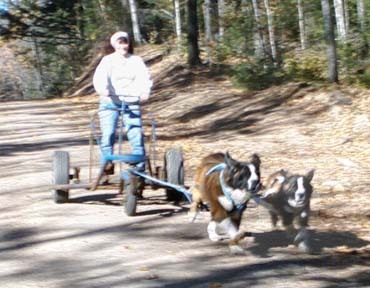 An x-back, or a recreational type harness can be used for pulling a dog sled, dog rig, a scooter, or someone on skis or skates. 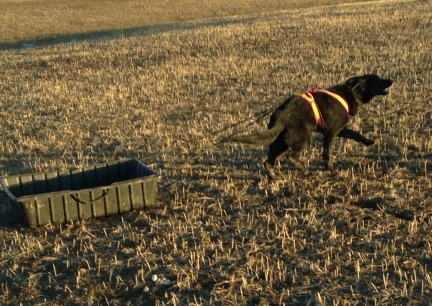 It is not the type harness you would use to work a dog in shafts....like a wagon or cart, for that you need a proper fitting cart and or a multipurpose harness. 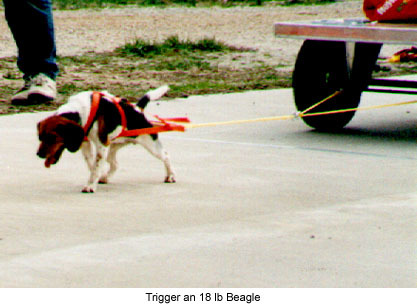 You would also not use an X-back or Recreational Harness for weight pulling with your dog. 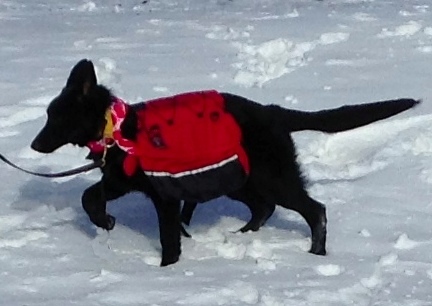 You have purchased a new sled dog harness, but, you have never put one on a dog before, now what? 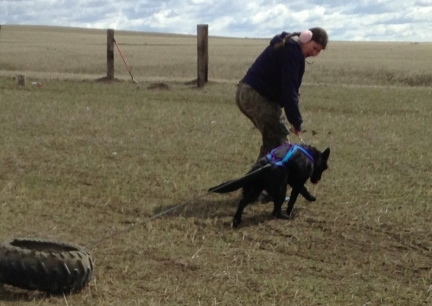 Take the tug, the loop at the back of the harness and hold the harness in the air. Is everything straight? Is the fleece padding to the inside of the harness? 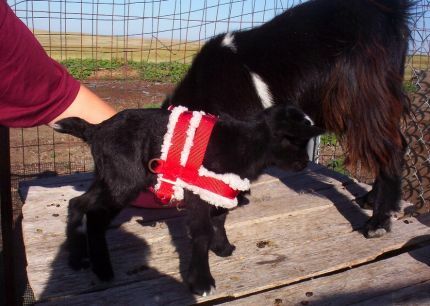 Now look at the harness, the fleeced 'X' is the top of the harness. This will go up on the shoulder area of the dog. You will notice a fleeced 'breast plate' that is longer then the 'X' on the opposite side of the "head hole", that part goes along the dogs breast bone area. Call the dog to you and if possible have the dog "sit" in front of you. 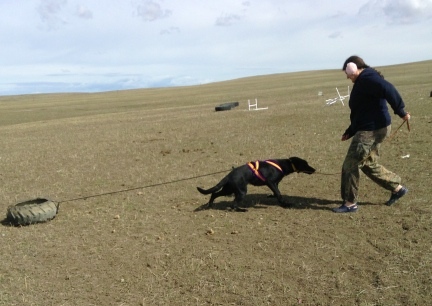 Take the tug in you right hand, now run you left hand into the harness in the opposite direction that the dog will wear it. Everything but the breast plate that is padded will be over the dog's back. 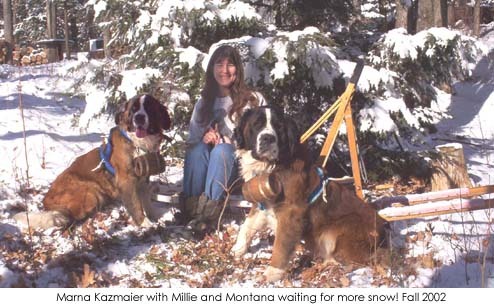 Now grab (gently) the dogs muzzle and pull the harness back over the neck of the dog. Stop, pull all of the dog's collars, leashes, tags and anything else you have on your dog forward past the harness. If you do not do this, your dog will be pulling with whatever you left under the harness digging into him. Now lift the dog's right leg up toward the dog, do not pull the leg out as your arm would go out from you side, but up towards the dog's body. Put the dog's leg through the leg whole, then repeat on the left side. Now take hold of the tug and pull it back towards the dogs tail... isn't that pretty!!! You have now successfully harnessed your "new sled dog". When you take the harness off the dog do it slowly and unharness one leg gently at a time, and again pulling the legs up not out. Pull the harness off so that it does not turn itself inside out. 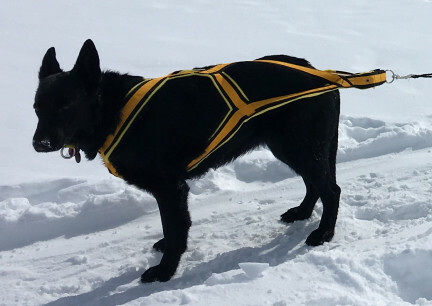 When the harness is off the dog, hold the harness again by the tug and make sure it is straight so that the next time you get it out, it is ready when the dog arrives to be harnessed. I recommend that you hang the harness by the tug between uses. Let's say that your dog has never had a harness on before and you would like for him to start pulling a load for you. Once the dog has the harness on for the first time, just do something fun...something your dog really enjoys doing, like eating, fetching, or going for a short walk. 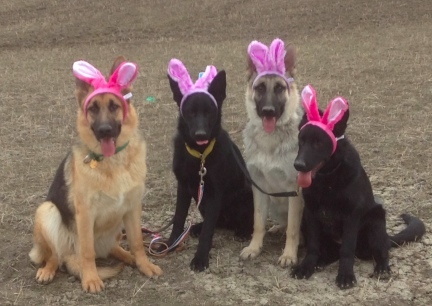 Make a fuss over the dog wearing the harness and give the dog extra hugs and treats. Take the harness off. Never leave a dog unattended with a harness on, it may chew up the harness and your fun is over... until you get it repaired. Now the work starts for you. You need a rope about 6' long or an old leash. 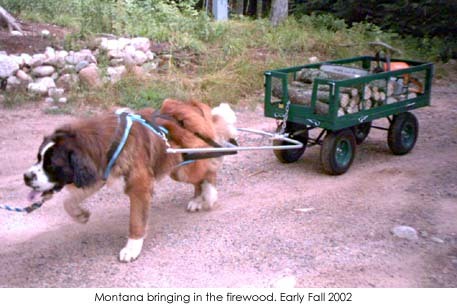 You need a small log or a small tire for the dog to pull. If you choose a log, drill a whole in the end of it and insert a screw in type eye bolt, this is what you will hook to the leash then to the dogs harness. If you choose a small tire, that too will get a whole drilled into the tread with a bolt type eyebolt thru that. Now gather all this gear together, put the harness on the dog as well as a leash and take a walk around your yard with YOU pulling the log or tire in your other hand. The dog needs time to get used to the sound of the item you are pulling as well as getting used to seeing something 'following' the two of you. If the dog is afraid or nervous about the item just reassure it and keep walking. Do not baby the dog, or he will never pull for you. That's all the lesson that you should do for the day but repeat the same lesson for next couple of days. Remember, you did not learn to speed skate in a day. 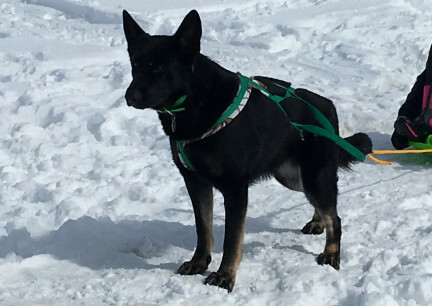 Now after the above training put the harness on the dog and make a big fuss over the dog...put the dog on a leash and take it outdoors, you may want to take the dog for a walk before you start pulling just to take the edge off your dog. 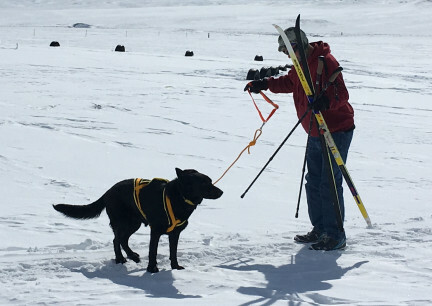 Here's the big moment...You have your dog in harness, your pulling item is attached to the leash you are pulling it with, you have treats for the dog when it is doing a good job and you are calm and ready. Let me tell you here!! Never let the pulling item hit the dog in the rear!! Hook the dog to the leash in your hand first, now hook the pulling item to your dogs harness, start walking telling the dog "Pull, Good Dog", if the dog is afraid hold your confidence and keep walking holding a treat in front of the dog so that it moves toward your hand as your tell the dog, "Pull, Good Dog". Just pull long enough (time wise) for the dog to get praise for the right behavior, maybe 10 - 15 minutes. Now some dogs, just 'get it', other's however you will have to work with like this for a week or two. Now your dog is pulling the item with confidence. 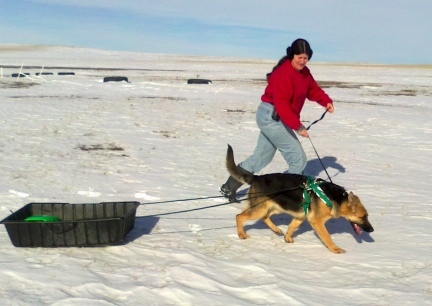 Start telling your dog the sled dog commands as you walk the when the dog is pulling and when you are just walking for fun. When you stop, say "Whoa" this is the most important command. Give the dog a "Let's Go" command each time you want him to move forward in harness. When going to the right day "Gee" (rhymes with see), and for left, "Haw". When the dog stops to sniff say "On By" as you pull the dog forward, always be sure to praise the dog for right behavior. Have treats with you and make a huge fuss over the dog. Try to get the dog out in front of you rather then walking at your side. When your dog is 'getting it' it is time to get out your scooter or a pair of skates (if you are quite brave) and a helmet and enlist a little help from another human. Get a long leash for the dog and have a friend hold the leash with your dog attached to it. Get your scooter or whatever you have chosen to pull ready with a six foot line attached. Have your helper move forward and you tell the dog the "Let's Go" command that you will be using. Remember, pay attention to what you are doing and do not ride up and hit your dog in the rear. Be sure to tell your helper that they will be running with the dog. I would use a spotter (the other human helping you until you really feel really ready to "GO"!. 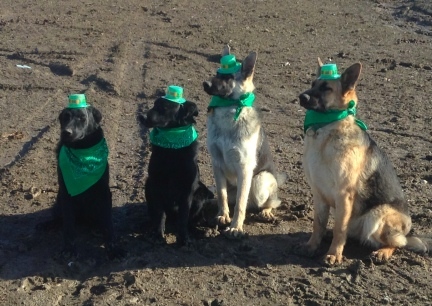 Always make sure that you have the right equipment and that is proper fitting when training or working your dog. 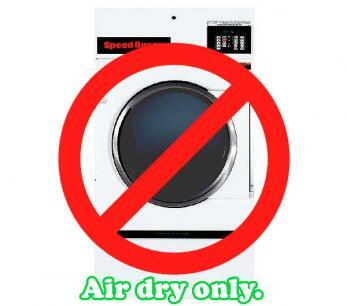 Check it often to make sure that it is in good repair and keep it clean for long life. Most webbing harnesses are machine washable but not machine dryable, hang the harness that is clean and wet by the tug loop for 24 hours (they look new again after a good washing). 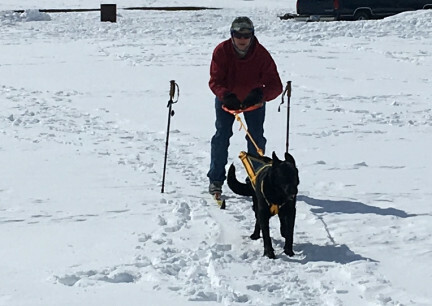 Other easier ways to have your dog learn to pull are....after the dog is used to having the harness on and is used to pulling the log or tire, have someone ride a bike or ATV in front of your dog while the dog pulls you. Start this on level ground. 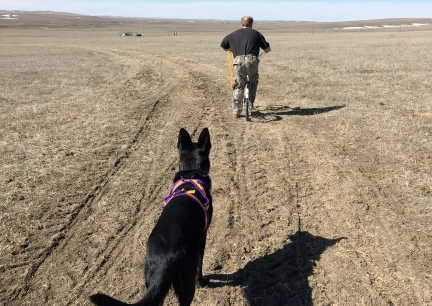 If you are really lucky to have a friend that is running their dog in harness, have your dog follow them out......dogs learn from other dogs, keep in mind that's also good and bad behavior, choose the dogs your dog learns from wisely. 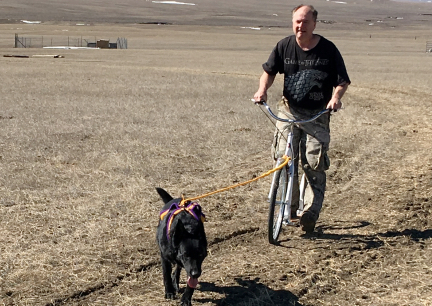 If your friend is really quite nice and your dog is well behaved and started well in harness pulling the log or tire maybe your friend will let you hook your dog into their team for a spin. Do not ask to drive the team. If offered, make sure you can handle the team before stepping on or into the driving stand or seat. 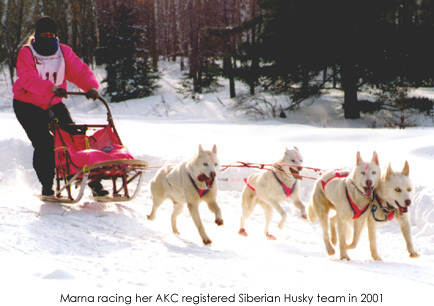 Your local library or the Internet has 'loads' of information on sled dogs. Our local Library, when we were in Antigo, WI, even subscribes to "Mushing" magazine. 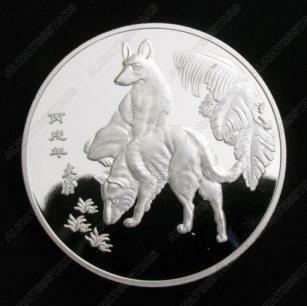 There are also several sled dog elist to join at the Yahoo Site. Good Luck and have a good time. 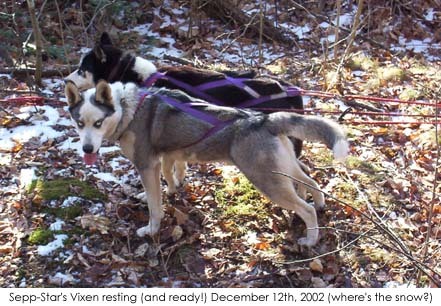 Get a lot of Photos and Videos of your dog enjoying being a sled dog. Time goes by so quickly and before you know it, your dog is a senior and retiring. You will want those photos and videos to show off to your friends and family, as well to look back at long after those dogs are gone forever. It saddens me terribly that what few photos I had, were ruined in Black Mold in N WI. 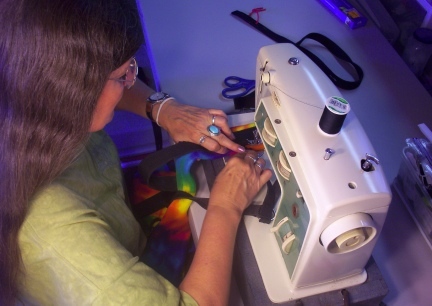 When I designed my Multipurpose Harness, there was NOTHING LIKE IT on the market at the time. 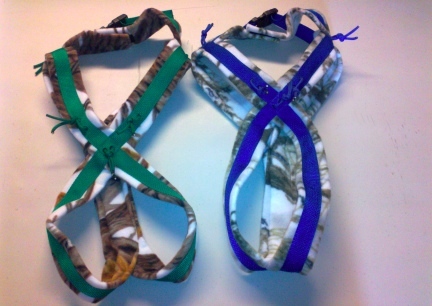 I designed it so that the harness front was like the old tested and true, hundred of years used, Siwash Harness. 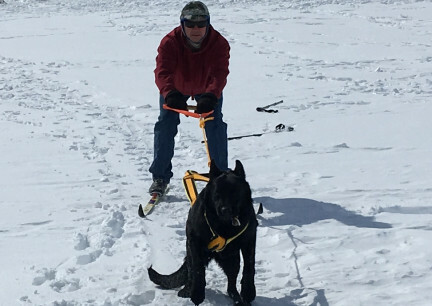 I also designed the harness so that my Labs could pull a boat in the lake near our home. I wanted the snap on top just in case they might become hung up on anything under water. 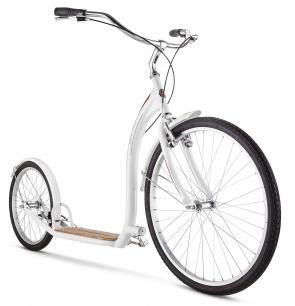 I also wanted it to be able to pull a sled or rig or scooter as well as anything with four wheels and shafts. This type harness has worked very well for us for many years now.....as well as for satisfied customers. HOW EXPENSIVE IS THIS HOBBY? 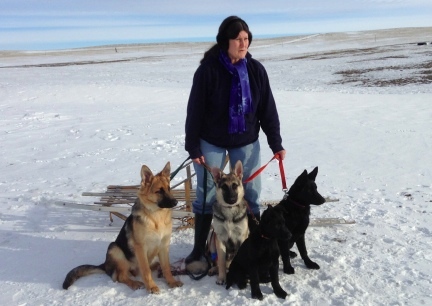 So now you are thinking you would love to have a small German Shepherd Dog Sled Dog Team, maybe even race them for fun. 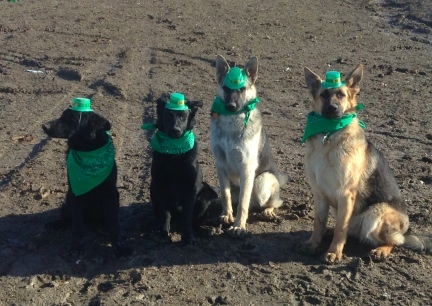 You have this little fantasy of you standing on the runners going down the trail with your beautiful German Shepherd Dogs, in matching harnesses of course, running a full speed! And what fun that is! 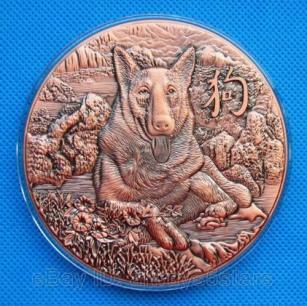 What would be the cost of something like this? Well first of all, training time. But financially? You own one dog and you buy it a recreational harness ~ $15-$20, not bad. You can have a lot of fun with one dog and one harness. Then you get, say, a scooter from a garage sale ~ $10-$15. Lots of fun. Now you want another dog ~ $5-$500. More food, more vet bills, MORE FUN!! 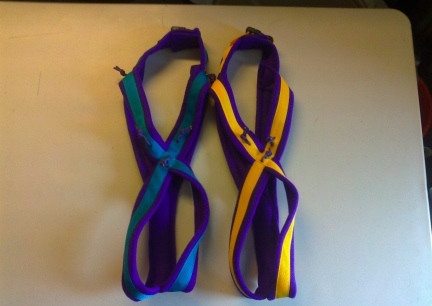 Again, a recreational harness for the new dog ~ $15-$20. Now you're thinking about a rig - light weight beginners rig ~ $200-$700. Gangline and neckline ~ $15-$25. A spare set of Ganglines in case the dogs chew the first ~ $12 (you won't need the snaps on your extra ganglines) But you will need some spare snaps to replace broken ones as time goes on ~ $2-$10. Sled bag, for carrying your gear ~ $5-$30. Dog bag to carry any dogs on the trail that might hurt it's foot or something ~ $35-$300. 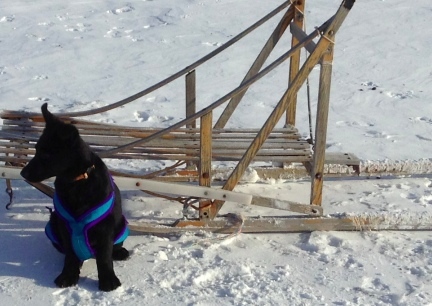 Now what you have been waiting for A REAL ALASKAN SLED!!! $300-$1500 (or more). OK, and you're going to haul this how? New vehicle-$________(fill in the blank according to your personal preference). And then maybe a trailer ~ $500 or more. Then you want another dog -it needs food, vet care, harness, and now you need a four-dog gangline.. Might as well get another dog too! By now you start to think you would like to have a "dog box". Build or buy ~ $200 and up. Dogsledding equipment seems to accumulate. Deron and I now own (that's today, and it could change tomorrow) seven sleds, five rigs, a sacco cart, several dog shaft converted child's wagons, a pony cart, three scooters set up for dogs to pull, an adult size tricycle great for training and conditioning lead dogs, several of the following, dog backpacks, dog bags, sled bags, etc. etc. Then there's all the winter gear for the musher ~ clothes, hats, boots, socks, sock liners, gloves, glove liners, mittens, over mittens, long underwear, etc. And then all that KOOOOL racing gear ~ headlamps, compass, small saws, snowhooks, heavy duty dog bags for mid-distance races, more dogs, more food, more vet bills!! Then you start looking for land of your own ~ no less than 40 acres will do of course. This is followed by building a home, kennels, and getting more dogs. 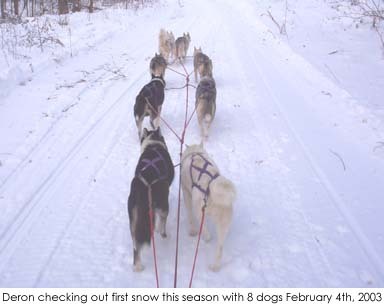 Somewhere along the line you ordered subscriptions to Mushing, Dog Fancy, Team & Trail, and Dog World Magazines. You've bought books on your breed and on the sport. 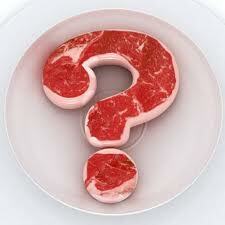 Some will notice (some won't notice, but still have it all) a change in your lifestyle. You're now wearing clothes with dogs, dog team, wolves and dog club names and logos printed on them. 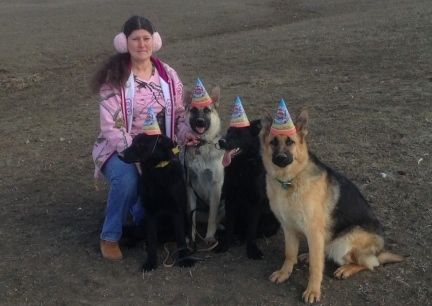 You ask for things like Steger Mukluks for Christmas and tie out chains for your birthday! 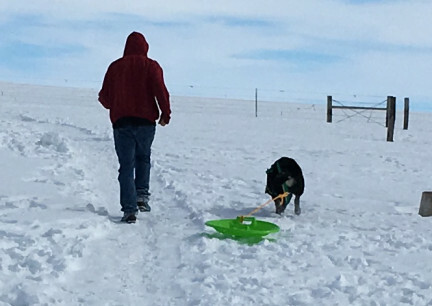 You find yourself talking about (and thinking about) dog food, dog care, dog breeding, dog sleds, dog rigs, even dog poop more and more as cold weather approaches. 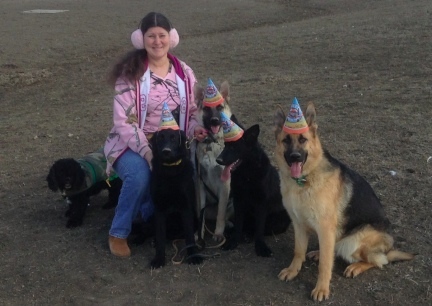 People are starting to recognize you in stores and other places as "the dog lady" or "the guy with the dogs" . Now you're getting it. Yes, you can have fun with one dog and a harness, but once you've trained and driven you own three dog team, YOU'RE HOOKED!!! How expensive is this hobby? How much do you want to spend on pure fun? 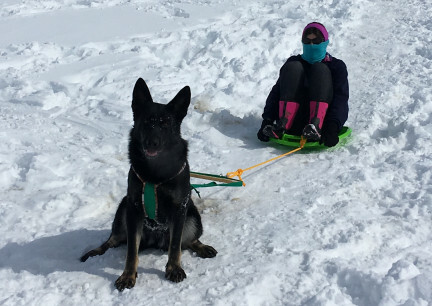 AND TRAINING OUR OWN GSD AS SLED DOG BEGINS! WHOA = Stop and this is your most important command. ON BY = to keep going, to leave things alone, to not stop and sniff the ground or other items. It is also necessary to get the puppies out and about so that they are used to things going on about them as they learn to work. 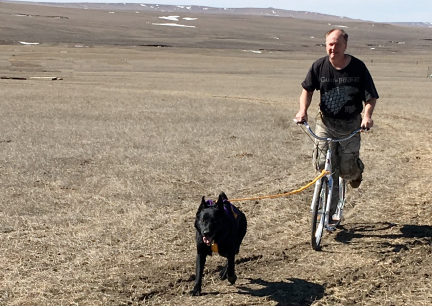 Deron and I do not teach our Sled Dogs to Heel at our Sides as we walk until they have learned to pull. It is easier to teach them to Heel later then to Pull (after teaching Heel) later. 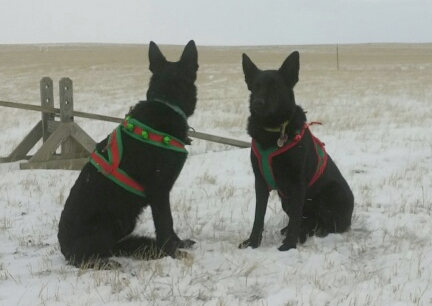 In this photo, taken 12-24-2013, Titus, who is Black and Cream, and Tekoa, who is Black and Tan, are wearing Bell Multipurpose Harnesses for the first time. 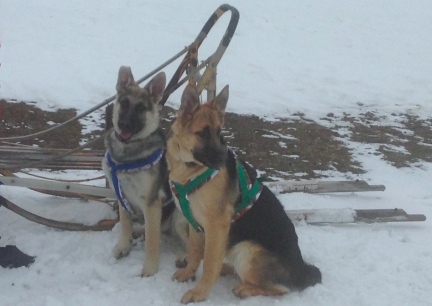 They are only 5 months old and won't be doing any pulling yet, but they are learning how a harness feels and the bells sound, as they walk about in it (each). Neither pup cared a bit about it. They are used to our hands all over them and they trust what we put on them. 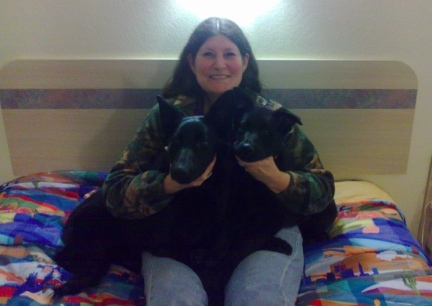 On New Years Day we paid for two little Black GSD that I found on the Internet down in Texas. 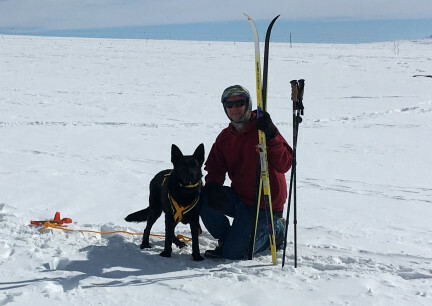 I was going to wait a year, but when it hit me that I would be 57 y/o in March 2014, I thought maybe I better get at this training and working my GSD team. 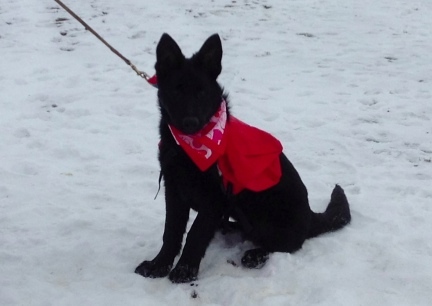 I have wanted a Black GSD,well, let's just say for many years. I had two in Total Blacks in the 1980 - 1990's. Jan 2, 2014 I made Multipurpose Harnesses for both Titus and Tekoa to start dragging with....that is to learn to pull, but without weight. 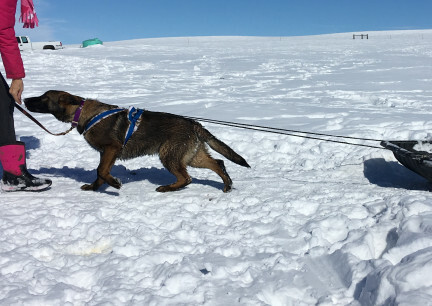 They are far too young to pull weight, but old enough to learn to drag, to learn to drag and learn that the Sled Dog Commands go with the process. 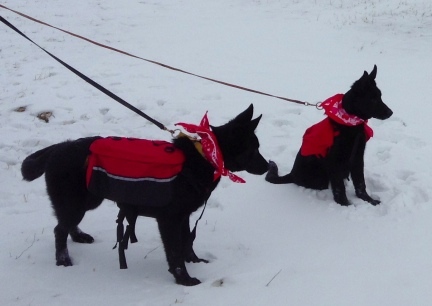 Jan 3, 2014 While waiting for our two new Black GSD Puppies to be delivered, we hired a Hauler, I made them each a Multipurpose Harness. 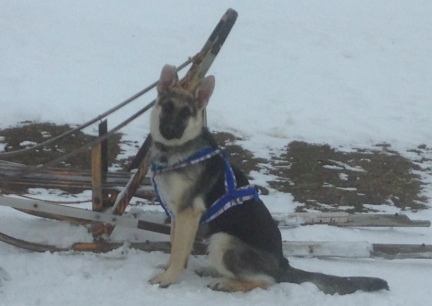 Mostly because I want to take one of the puppy's "growth photos" (see their page for the growth photos) wearing a harness sitting in front of the dog sled. 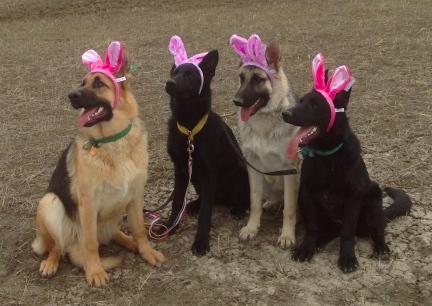 The new Black GSD puppies arrived later than evening. They are now named, Turquoise and Texas Tea. I am thrilled. Jan 7, 2014 we had a little photo session...and Deron took a LOT of photos. 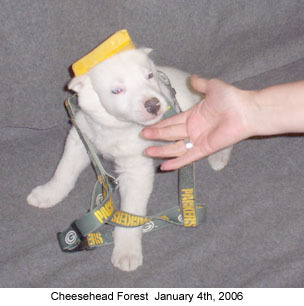 the photos of the puppies in harness is not only the first time they wore them, and both puppies could care less, no problems at all, but each of those photos will be their growth photos, taken in the same way to show them growing. Turquoise is wearing the turquoise harness, and Texas Tea is wearing the Gold color harness. I sat with each for a photo...and WHAT WAS I THINKING WEARING SUCH A DARK JACKET TO PHOTO BLACK DOGS?! 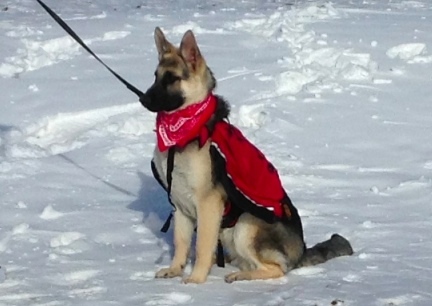 The past few day have been far to cold to take puppies out to train. But today, you can see here, they were doing pretty good....pretty good, there were "outtakes". This is what I now call my "The T Team". 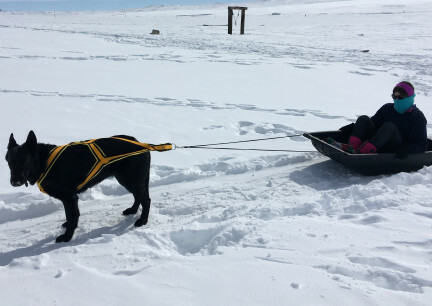 Titus and Tekoa pull the light weight Ice Boat with a gallon jug with frozen water in it for the first time. They each did very well....excellent! 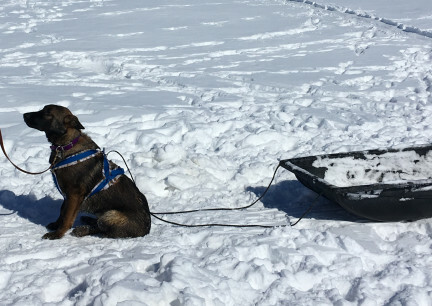 The Ice Boat is what I use to pick up and take dog poop to the fence line (putting in a mote) and Titus and Tekoa walk with me when I do this, they were used to the sight and sound of it around them. Titus drug the days dog poop out to the fence line...where we dump it. There were snow spots and dry spots, he did really well. 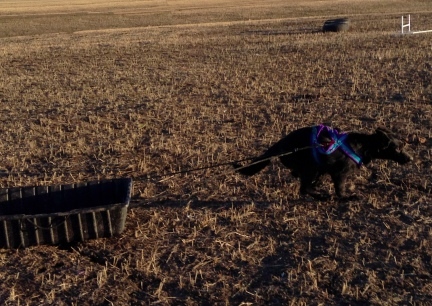 Although the load was certainly not heavy, or hard to pull, I still call it working when the dog is doing a job. HAPPY VALENTINE'S DAY! 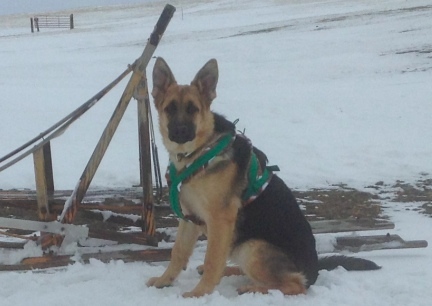 OUR PUPS ARE TRAINING EVEN IN THE COLD HERE IN NW SD, maybe not as much as I should be out there with them. 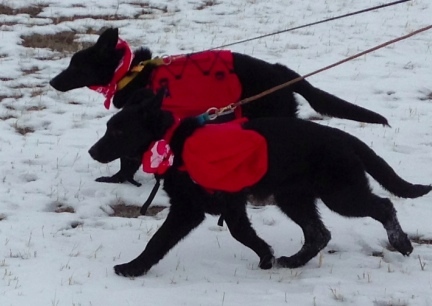 THESE PHOTOS ARE TITUS AND TEXAS TEA WEARING EMPTY BACKPACKS TO LEARN THE FEEL OF THE PACK ON THEIR BACKS AS THEY WALK. THEY ARE TOO YOUNG TO CARRY LOADS, BUT THEY ARE OLD ENOUGH TO LEARN ABOUT THE PACK....standing still as it is put on their backs, the sound of the snaps, and taken off and how it feels to wear it. (Texas Tea is NOT Roached Backed, she is coming out of a sit). A few days later, Texas Tea and Turquoise. This was Turquoise FIRST TIME wearing an empty Backpack. She did not care about the pack, she stood still for the snapping it on. BUT! When she and Texas Tea started walking together?....let's just say there might have been more than two "outtakes". Between the weather and taking the time to train, well, shame on me, it has not been done before today. 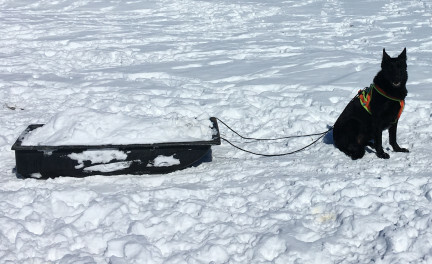 This is a photo of Texas Tea pulling an empty Ice Fishing Boat for the first time. I was thrilled at how smooth and well it went. Like Titus and Tekoa, I hooked Texas Tea up to the boat and she just went right along. Then, after training Texas Tea, I had the photographer, Deron, pull the boat back down the hill and I went and harnessed Turquoise. Silly me, I know better. The mud here is a mess! But at night it freezes, so for a very short time, early in the morning, I can train, otherwise, well, I could go on and on about the soil here (I HATE IT), but let's just say, I was trying to get Training Time on each dog and perhaps got in a bit of a hurry. I did not walk the boat out in one hand, with Turquoise's leash in the other hand, as I KNOW I should. I walked Turquoise up to the boat where it was sitting and.... Actually, she did well. Just was a bit afraid, just a bit, at first. As you can see in the photo though, she did trust me and straightened out and pulled it well. Next time, and I so hope it is tomorrow, I will only pull the boat around as I walk her. My mistake. Taken 3-2014-03-16 (from right to left) Texas Tea, age 7 months, Turquoise, age 6 months, Titus, age 8 months and Tekoa, also age 8 months. 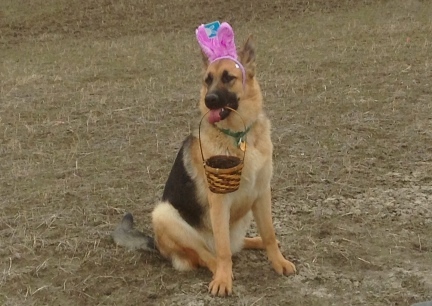 Our GSD, taken 3/30/2014. 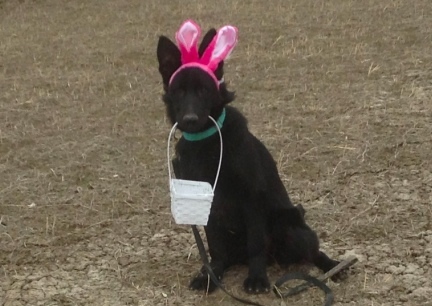 I wanted to work more with them on holding the baskets, the reason you see leashes in the photos, but we are getting hit again today and this week with more snow (we are now under a Winter Storm Warning) we wanted to at least get a few Easter Photos without Snow. 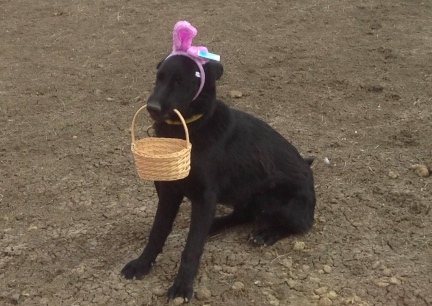 Texas Tea does not have a Basket Photo only because we were running out of time....they are pups. Titus & Tekoa are each 8 months old, Texas Tea 7 months old and Turquoise is 6 months old. 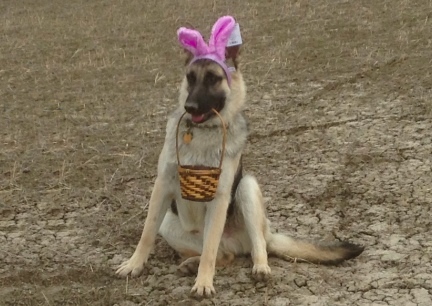 Hopefully, we will be able to train more with the baskets and have weather so we can take more photos closer to or on Easter. The mud finally dried enough that I could go out and train the GSD a bit. I took Texas Tea, Titus, then Turquoise out, one at a time, and had them pull a tire a short distance. WOWSERS! Did they do well! I have not made Tekoa's new harness yet (she outgrew hers) so I need to get on that. Time is ticking and the Sacco Cart a waits! Now. That has changed. We have the two new pups and we are working the dogs in harness again. 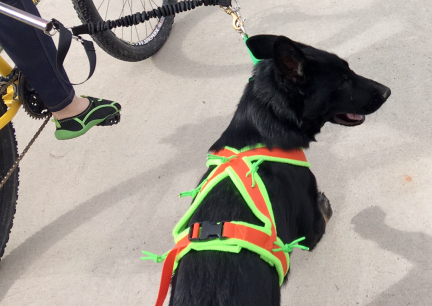 This is Tabaliah in her Brand New Bright Colored Matching Harness. 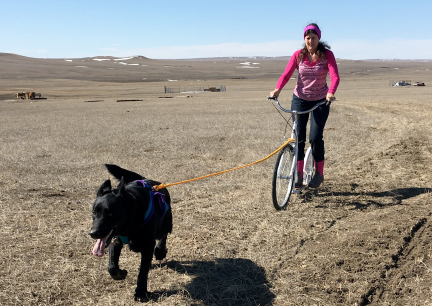 She is running with our bicycle learning about wheels and trails and the Sled Dog Commands....little by little. She is NOT being pulled along, she slowed to see her daddy the photographer, if you look at the other photo you can see all the slack lines as she runs along...much of it trying to outrun me. I am also now shopping for a new Dog Scooter. 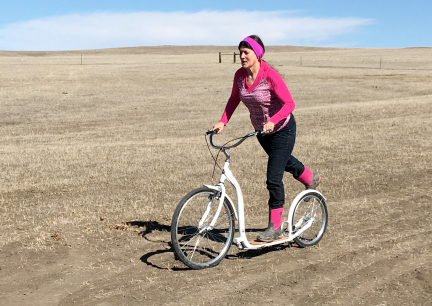 Deron surprised me with a New Kick Bicycle Scooter gift for my 60th Birthday Gift... We have been riding it without dogs, to get used to it, and get our bodies going again, muscles used, before hooking to the dogs. It is GREAT fun and a Good Work Out without the dogs....can't wait to hook up the dogs and fly! 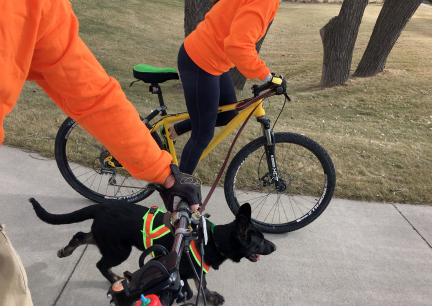 Deron and I went out with Texas Tea (pulling Deron) and Turquoise (pulling me) and had such a good time, WE CAN NOT WAIT TO GET BACK OUT THERE AND DO MORE DOG SCOOTING! 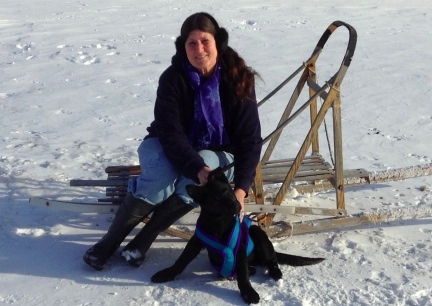 and More Sled Dog Training! 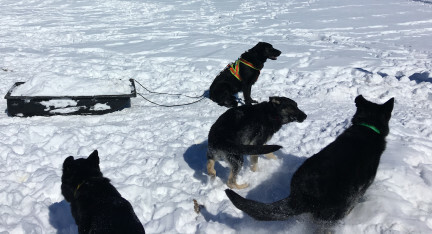 We made a point to take the camera out and take photos as we worked Turquoise, moving snow away from the house and started the two pups, Tikuah and Teanna in harness. This was the pups first time in Harness. Note all the chaos in the background as Turquoise was working. 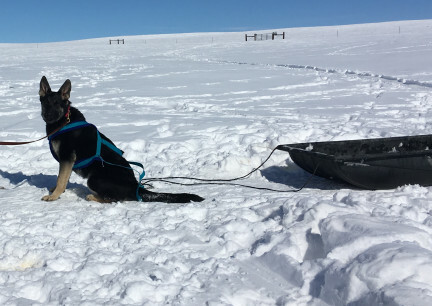 Not only does a Sled Dog have to know how to pull, all of the Sled Dog Commands, that we teach as they walk on leashes, but also to stay focused while they are working...no matter WHAT is going on around them. 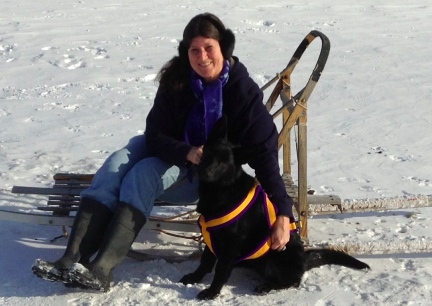 Deron and I have so very very few photos of us with our Sled Dogs, a person's hands are so FULL and dogs so excited it is hard to get photos....we are trying to make a point to take a few photos of our dogs in harnesses on the snow this year. These are of Texas Tea and Tabaliah. 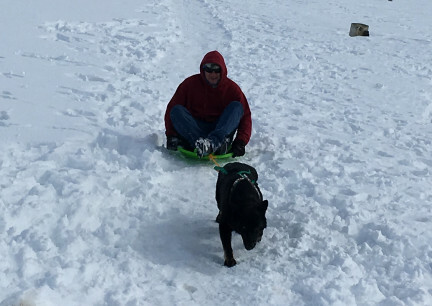 We were just playing with the sled, saucer and Deron did a bit of Skijouring. PLEASE VISIT OFTEN, THIS PAGE WILL BE A WORK IN PROGRESS WITH MANY MORE PHOTOS TO COME.